Map editor is in a closed-beta stage. Not everything is finished. 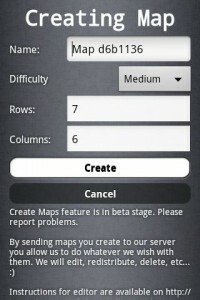 Right now you can create a map for yourself and send it to server for me to see. In the future I will include best maps in some kind of ‘users pack’. Below you can find explanation how to use it as it is not completely clear in it’s current state. If I get positive feedback (critical positive feedback too) I will work upon it to make it more and more useful. To use map editor, you have to solve 30 maps. 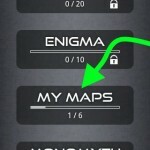 This ensures that you know enough about game to construct your own maps. 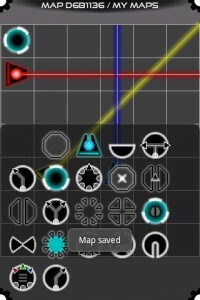 You enter map editor by going to ‘My Maps’ pack. After you press ‘Create’, you will be taken to Edit Mode of your new map. Here a very important button is at the bottom of the screen. It shows list of elements that you can drag-drop on your map. You can place as many elements as you need. You can change color of laser / receiver / filter by long-dragging element (you long press element and drag it a little – I will fix this later). Using this menu you can delete the tile (or just drag empty tile over it). After you are finished, you can go to play mode by using Android menu button. PS. I am not a lawyer, but be informed that by uploading map to my server you give me license to do whatever I want with it. When working with maps, I follow more less pattern described below, you may find it useful. 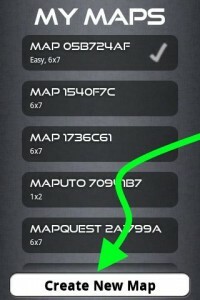 Play and try to solve your own map, if you cannot, see screenshot from step 3. If it’s trivial, go to step 2 and fix it.